A Bertram Bile time travel adventure, set along the length of the River Thames. My name is Jack. I’m an orphan at the Founding Hospital in London, where I’ve been since I was five years old - some birthday present that was. Things are about to go from bad to worse when some boys are mean to me. What happens next is going to change my life forever, but will it be all bad, or could there be a silver lining? 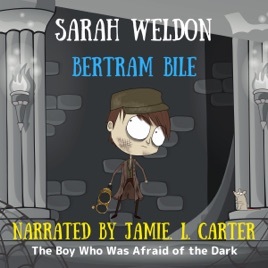 The Boy Who Was Afraid of the Dark is the seventh audiobook in the Bertram Bile Time Travel Adventure series, which follows the course of the River Thames from its source in Gloucestershire to the North Sea in Essex. But don't worry if you miss an audiobook or two, you can jump in at any point in the series. If you enjoy audiobook seven, don’t forget to check out the next audiobook in the series, The Raven's Curse. The Bertram Bile series is based on Sarah Weldon’s real-life expedition as she swims the length of the River Thames from source to sea, visiting the places that inspired the stories. Check out Sarah Weldon’s website for all the behind-the-scenes of each story and swim. Look out for Sarah’s Libby Lane series too.